First, and pardon the editorializing, but shouldn’t someone have suggested a name other than GAZOO? More importantly, though, the statement suggests that more high-performance Toyotas are on the way. For now, the Supra must suffice. Developed in partnership with BMW, the GAZOO Racing (GR) Supra debuts in 3.0, 3.0 Premium, and Launch Edition trim levels when it goes on sale in the summer of 2019. It is a cousin to the recently introduced third-generation BMW Z4. Inspired by the Toyota FT-1 Concept, and drawing upon the heritage of the original 2000 GT and fourth-generation Supra “A80,” the new 2020 Supra “A90” certainly is eye-catching. To find beauty, however, you must prioritize function over form. Like most modern Lexus and Toyota models, the new Supra looks best when viewed from the rear. And with this car, that’s the vantage point most others will get as you roar away. In addition to white, black, silver, and gray, the new Supra will be offered in Renaissance Red, Nitro Yellow, Downshift Blue, and Phantom Matte paint colors, the latter a gray hue. Like the BMW Z4, the new Supra is a 2-seat sports car. Open the doors, and the Bavarian connection is made clear though German-sourced displays, systems, and switchgear. It probably smells like a BMW, too, given that both cars are built by Magna Steyr in Graz, Austria. Toyota says it took a unique approach to the center console design, though, in order to create a more driver-focused, cockpit-style look and feel. Soft kneepads help to ensure comfort when the Supra is driven in the manner for which it is intended. Racing-inspired sport seats feature integrated head restraints and wide shoulder bolsters designed to grip the driver and passenger in corners. Alcantara suede is standard, with heated leather seats available with Premium trim. Toyota did not define which upholstery it applies to the Supra Launch Edition. Cargo space is generous enough for two people on a weekend trip, according to Toyota. It is also long enough to accommodate a track-day toolkit. A BMW drivetrain powers the new Supra. It’s the same turbocharged, 3.0-liter inline 6-cylinder engine that you’ll find in the new BMW Z4, making 335 horsepower and 365 lb.-ft. of torque. The torque is available from low rpm, making the Supra feel especially responsive. A sport-calibrated 8-speed automatic transmission powers the rear wheels, and drivers can choose between Normal and Sport drive mode settings. Paddle shifters add to driver engagement. Toyota says the 3,397-pound car will accelerate to 60 mph in 4.1 seconds when you engage the Launch Control feature, and top speed is electronically limited to 155 mph. 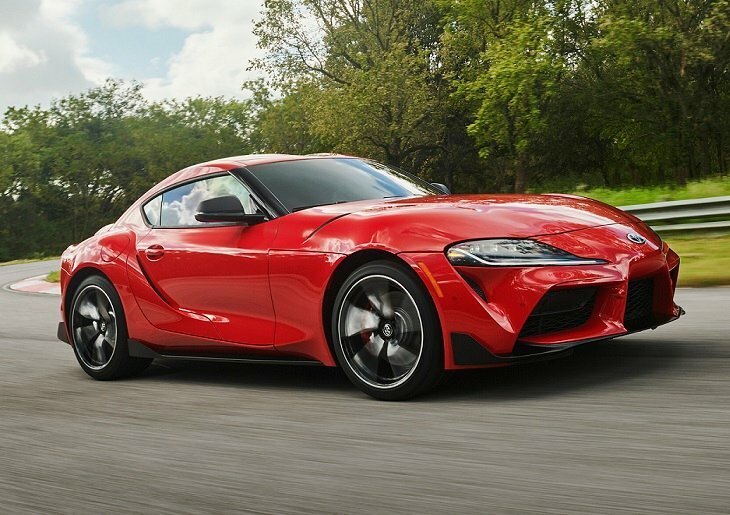 Though the Supra and Z4 share commonalities, Toyota says its sports car has unique driving characteristics. For the Supra, specific structural reinforcements, suspension tuning, and stability control settings give the car its own feel from behind the wheel. Boasting a perfect 50:50 front-to-rear weight distribution, the Supra features an adaptive damping suspension, variable ratio and variable assist steering, and high-performance wheel hubs. Forged, thin-spoke-aluminum wheels get staggered width Michelin Pilot Super Sport performance tires sized 255/35R19 in front and 275/35R19 in back. To further enhance the Supra’s handling, Toyota employs a standard active differential using an electric motor and multi-plate clutches to control torque distribution between the rear wheels. The system can put up to 100% of power output to a single wheel, and Toyota says it helps to maintain speed in corners while reducing oversteer and understeer. Standard safety equipment includes forward collision warning with pedestrian detection, automatic emergency braking, lane departure warning with lane keeping assist, and automatic high-beam headlights. Full-speed-range adaptive cruise control is available, along with blind spot monitoring, rear cross traffic alert, and rear collision warning. The Supra 3.0 is equipped with a standard 6.5-inch infotainment display operated using controls on the center console. It can be upgraded with navigation and a 12-speaker JBL premium sound system. Navigation and JBL sound are standard for the Supra 3.0 Premium, which features an 8.8-inch touchscreen display, wireless Apple CarPlay integration, wireless smartphone charging, and Supra Connect telematics service. This same setup is likely included in the Supra Launch Edition, too. Road sign recognition technology is standard in all Supras, and a head-up display is optional.